How cute are those?? I can only take credit for execution on this one. My sweet friend/ partner-in-crime Erincame over for a craft day this week. She told me she would be bringing lots of “goodies”! 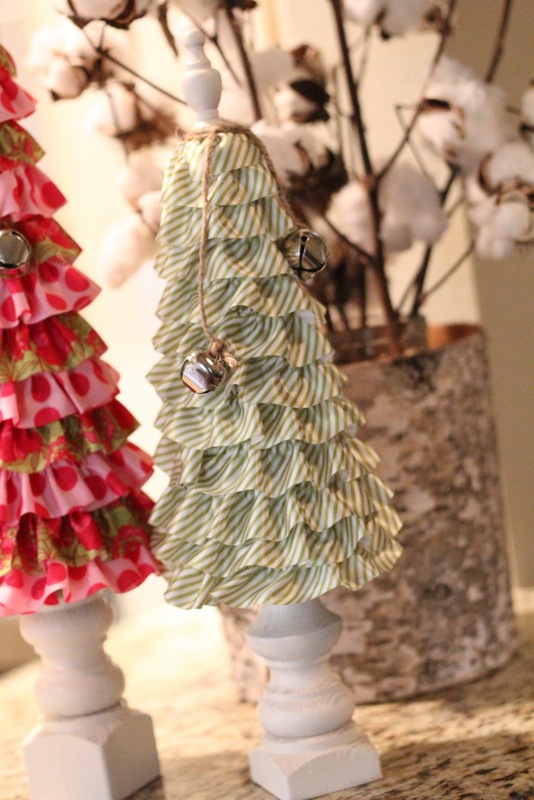 Not only did she bring goodies… She also brought LOTS of super cute ideas! This is just one of them. 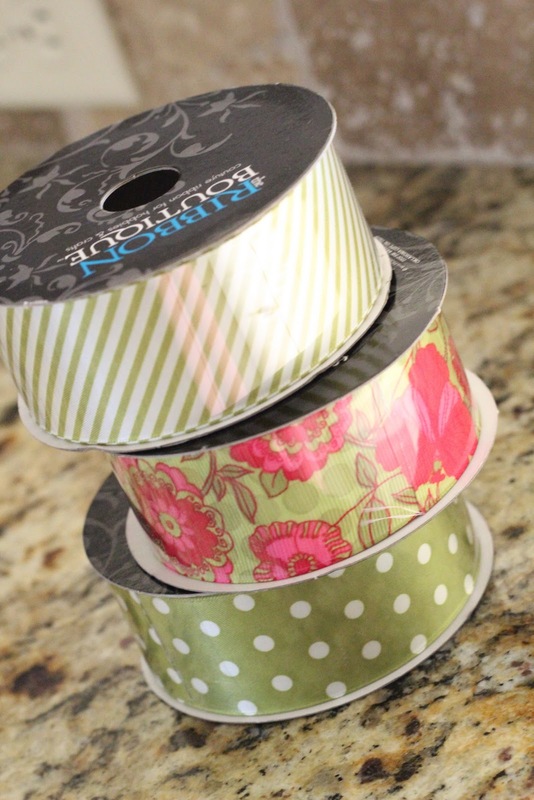 We started with some super cute ribbon from Hobby Lobby. 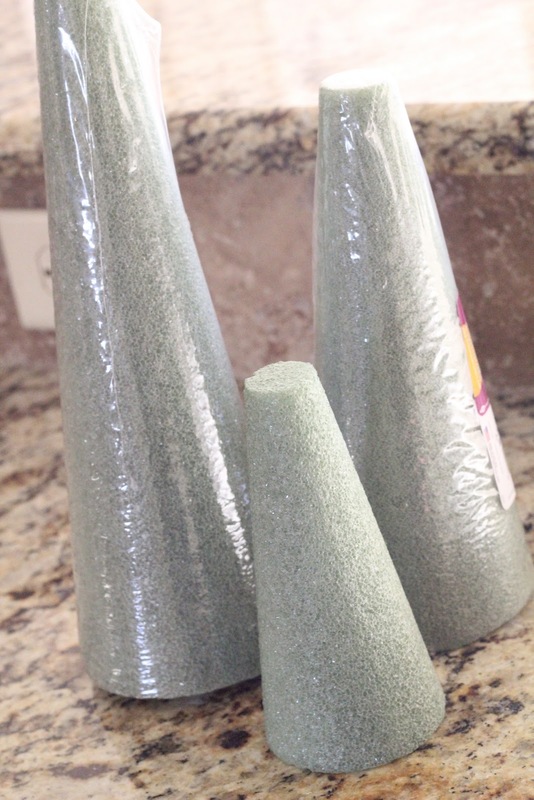 And a few styrofoam cones! I ran one end of the ribbon through the ruffler and a few minutes later I was done. I started by glueing the ruffles from the bottom to the top. I used my hot glue gun at a low temp setting to keep it from melting the cone. 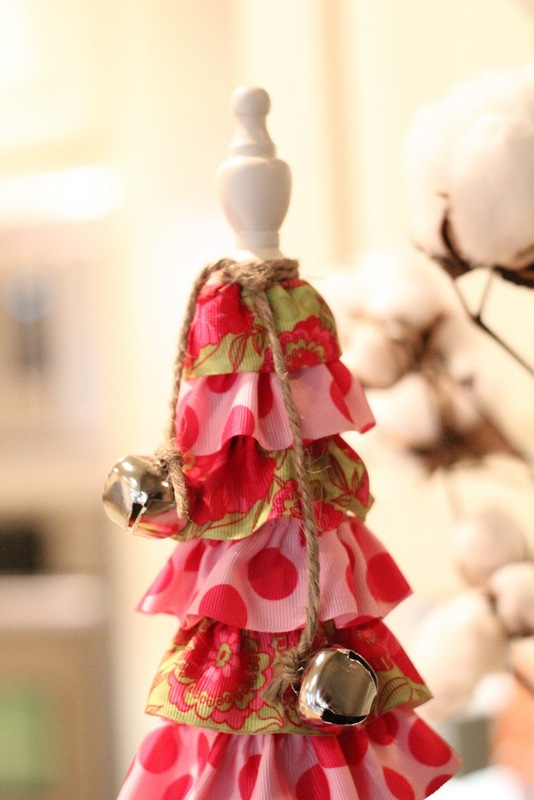 On this tree I alternated my ribbon on each row… Just because it’s cute. 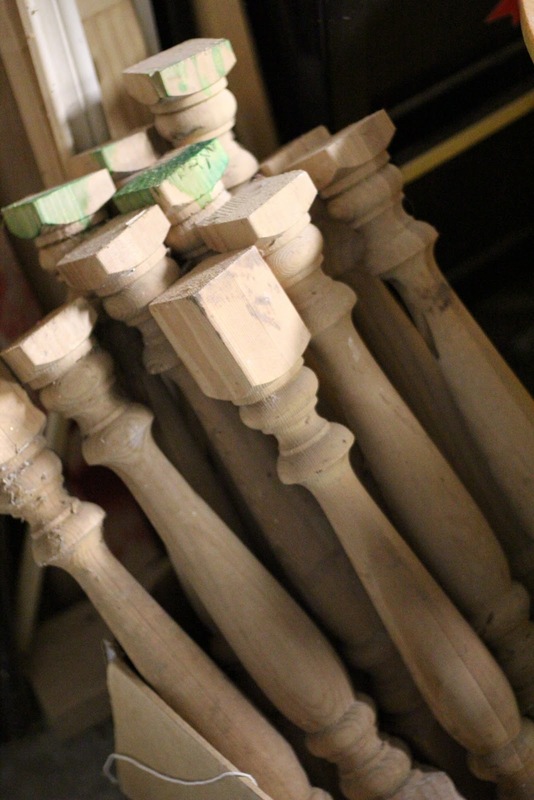 We needed some feet for our trees and I quickly remembered the stash of wooden spindles I scored in Round Top that have been hiding in my garage. My hubby has asked if he can throw them out about 16,465 times so I am sure he was happy to see at least two of them leave the pile. I used my saw to cut off the ends of a couple of them to use as bases. 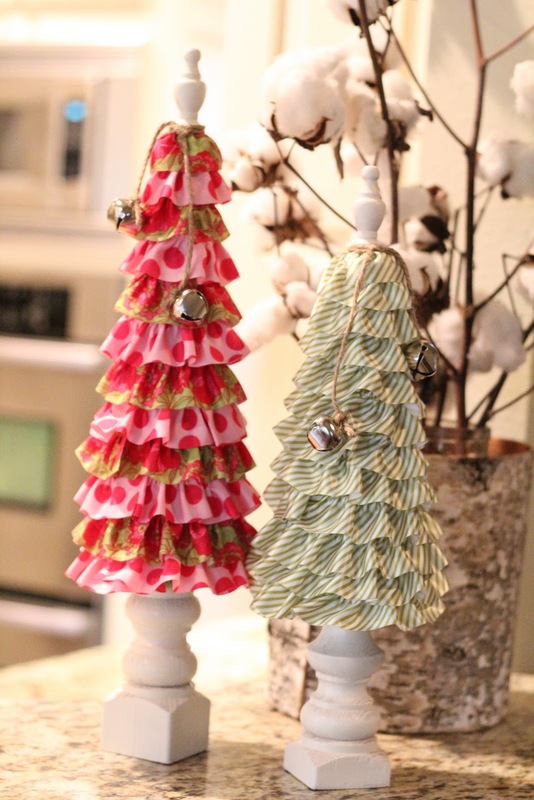 You can also use a candlestick like Erin did on her paper trees! Then I gave them a coat of our very fav Rust-Oleum Painter’s Touch Heirloom White! 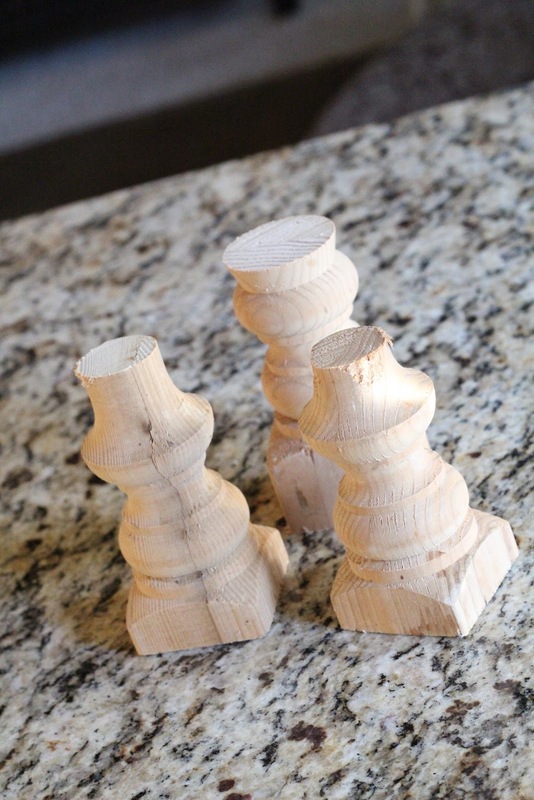 I also used it to paint these super cute mini finials I found at Hobby Lobby! Finally, I glued my base to my bottom. 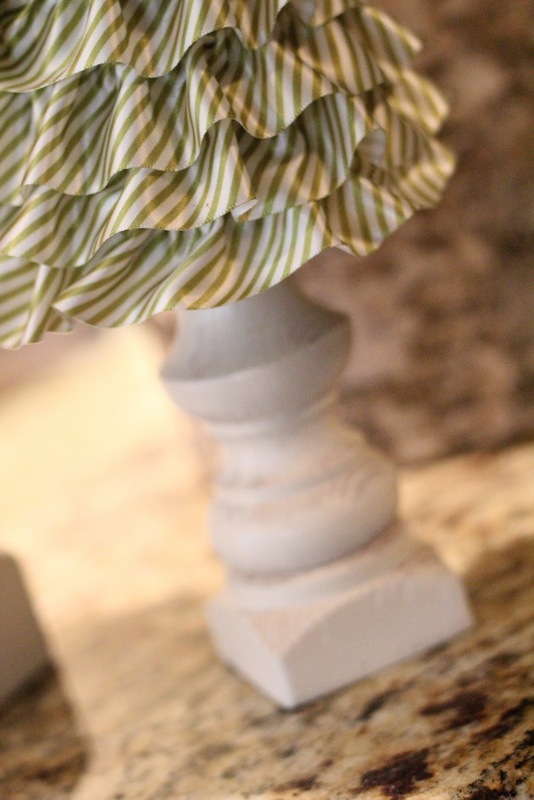 I glued my finial to the top and wrapped some twine around it just because it’s cute. I had some little silver jingle bells that I tied on to each end. That’s it! Don’t you love them!?! 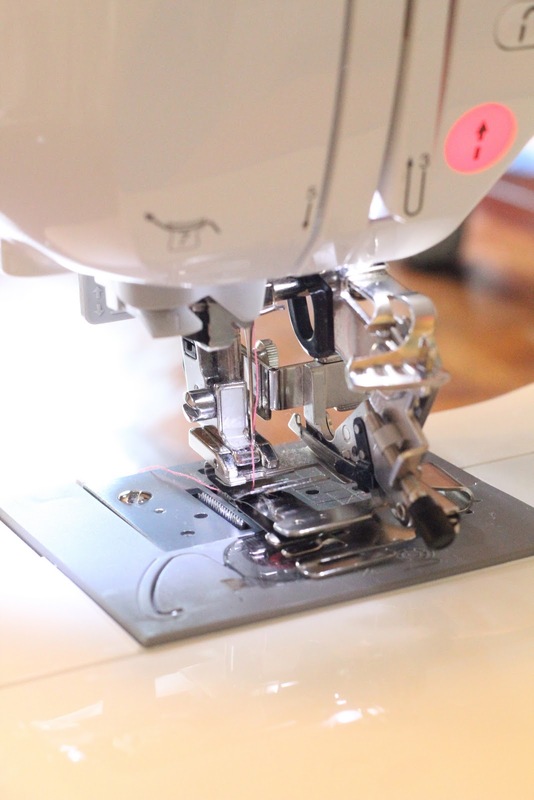 So now is the time (if you have not already) to get a sewing machine and ruffler on that Christmas list!! It’s so easy… I promise!! I hope you like trees because there are more to come :-)!! Okay, I am a pretty avid sewer and I DIDN'T click off the page!! LOL I am going to buy one those!!!!! Hopefully, by the end of the weekend, you totally convinced me. I didn't realize it was that easy! Thanks for sharing. This is such a fantastic idea, thanks for the tutorial. 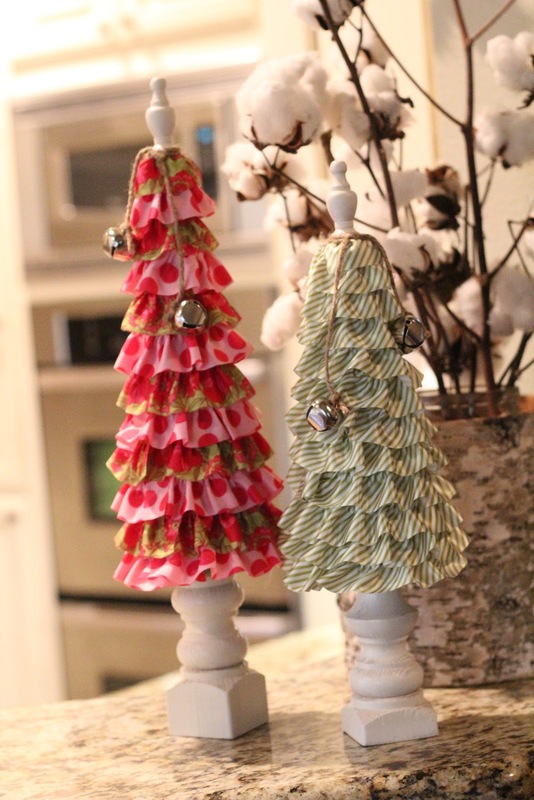 Heading to Hobby Lobby tomorrow, I have to make some of these. I love, love, love the trees. 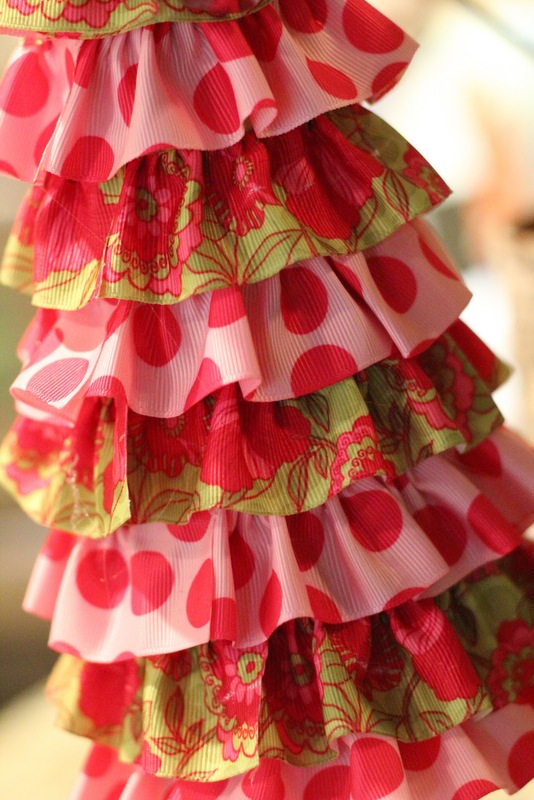 The ruffles just make them. And those little finials, and then to know that something you had been saving all this time, was finally coming out for use? Oh I bet DH was thrilled to death, and then probably asked, can we throw them away NOW? Oh thank you for the beautiful share. I am definitely going to be making a couple of these. So darn cute. Those are adorable! I am actually looking for a sewing machine for Christmas. What model do you have? Any tips for picking one?? So cute! I stumbled your post and facebooked it out. LOVE IT!!!! 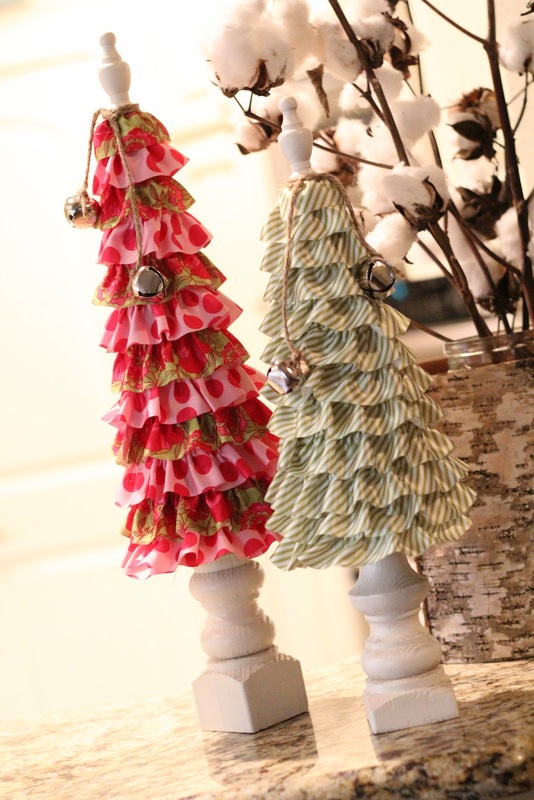 Ruffles and Christmas trees? Yes please! Those are BEYOND CUTE! I love them! I will be featuring them tomorrow morning! These are darling! Oh…I want to make some. These are really cute. I need one in muslin, one in burlap…. thanks for the idea! It's a really bad picture from my phone. LOVE my ruffler.. I don't know whatever I did before I bought one. AND…. I had a little girl! 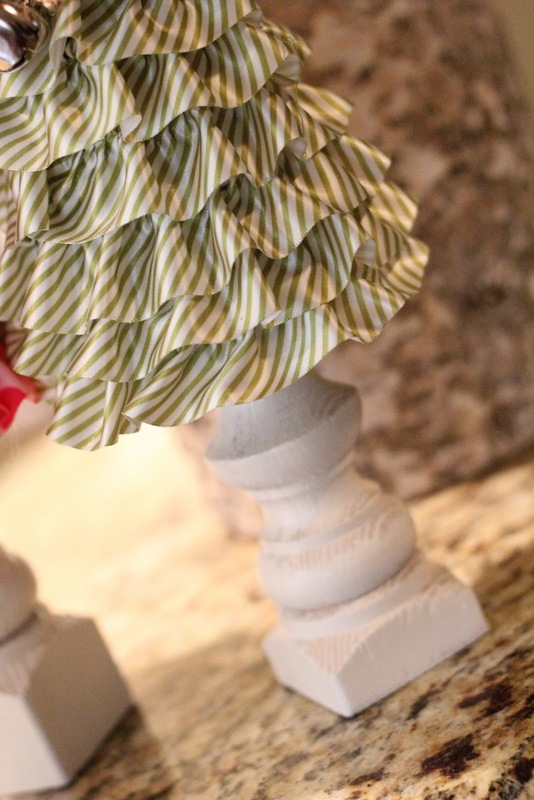 Oh, those ruffles. I came back to leave a link to a project I did last month with one of those foam trees. Would love it if you dropped by when you get a chance to see it. And I love the logo and style you chose for your new look! I love love love this idea! I have been thinking about getting a sewing machine for a while and I think this might have convinced me! Holy cow!!! You took those and ran with them! Seriously, Whitney, they look amazing! Super great job. And I'm seeing burlap…can't wait to check out that version. You rock. 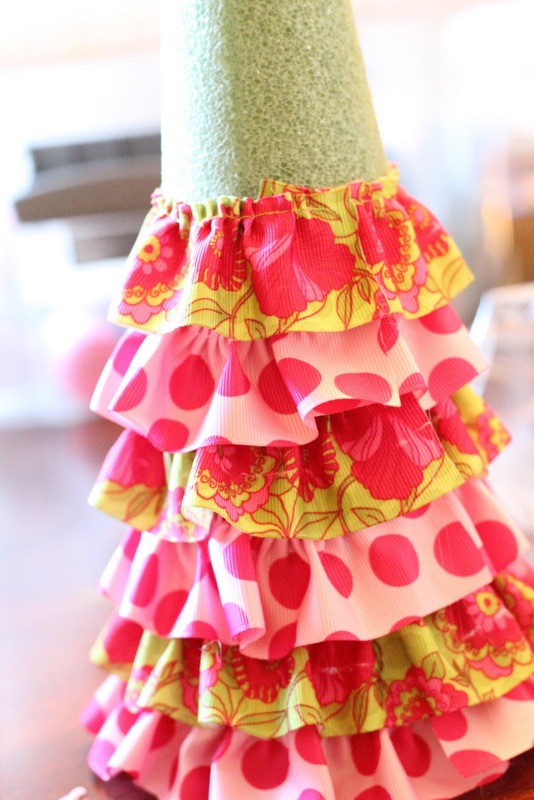 Ok…Love the trees…I have a pretty advanced sewing machine but never heard of the ruffler foot? Does it go by a different name? Great idea!